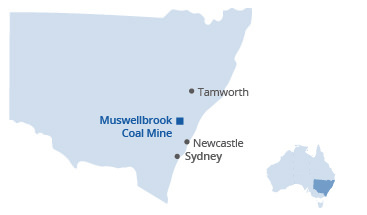 Muswellbrook Coal Company (MCC) has been part of the Muswellbrook community for more than 100 years, providing economic benefits and employment opportunities. MCC supports community groups, and businesses along with participation in local cultural and community events through sponsorship, donations, and in-kind activities. Launching an initiative with St Joseph’s Aberdeen School to help their agriculture students learn about animal husbandry, by providing them with access to agricultural land to run cattle. Sponsorship of regional events such as the Muswellbrook Show, Muswellbrook Rotary, Endeavour Group, Girls Academy Program-Role Models and Leaders Australia and the Muswellbrook Cup Race Day. MCC keeps the community up-to-date with mining operations, environmental initiatives and community matters through an independent Community Consultative Committee (CCC). The Committee provides regular information on the mine operations while ensuring the views of residents, local businesses, and community groups are considered in decision-making processes where the community has the potential to be impacted. Members are involved in the review of environmental monitoring data and are kept up-to-date on mining operations through presentations and site visits. Minutes of all CCC meetings are publicly available on our website. We also maintain regular communication with nearby landholders through meetings, telephone contact, and via a toll free 24-hour Environmental Contact Line.